From Our Staff: What Does it Mean to Promote Smarter Energy Use for All? This blog post is guest written by Elevate Energy’s Senior Manager of Housing and Community Development Emily Robinson. Members of the Chicago Resilient Families Task Force—a group of aldermen, academics, and others investigating policies to alleviate poverty—recently held a “listening session” where a group of approximately 20 Chicagoans with low incomes shared their struggles meeting basic needs, including housing, utilities, food, healthcare, childcare, and transportation. The listening session made clear that Chicagoans at the bottom rung of the socioeconomic ladder are finding it more and more difficult to make ends meet even as they work full-time at minimum wage jobs. A woman who works as a nursing assistant at Swedish Covenant Hospital talked about how her $800 paycheck doesn’t stretch far enough after she pays $500 for rent and $200 in subsidies for her three-year-old daughter’s childcare. If her daughter didn’t spend every other week at her father’s house, she wouldn’t be able to adequately feed her throughout the month. The lack of decent affordable housing was a common refrain. Residents spoke of paying hundreds of dollars a month for apartments that didn’t have working appliances. Utility expenses are also a challenge. A case worker from Back of the Yards spoke about how hard it is helping former felons find work. He spoke about his sister, an office admin at a doctor’s office, who makes so little she must choose between paying her light bill or purchasing her asthma medication. A homeowner who has lived in West Humboldt Park for more than 50 years spoke about the difficulty of keeping up with routine maintenance on her two-flat when living on a fixed income. The owner, in her 70s, contacted Elevate Energy after her boiler stopped working in October 2018. We visited her home and determined that an inexpensive clean-and-tune would get the heat back on. We also patched a damaged section of her roof that had caused a leak in both units. A 52-year old resident of Englewood said her gas bill has been cut off repeatedly. Already struggling to make ends meet, her adult son was diagnosed with schizophrenia recently which has further set the family back financially. She’s not alone. 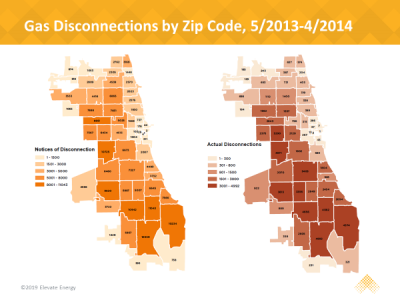 Elevate Energy’s Research and Innovation Team found that hundreds of thousands of Chicagoans are paying more than they can afford on heating costs and tens of thousands face disconnections each year. In the graphic on the right, the first map shows the number of disconnection notices over 12 months spanning from May 2013 to April 2014. The second map shows the number of actual disconnections during the same time period. The notices and disconnections are concentrated in the south and west sides of Chicago, where segregation is entrenched and many residents earn below median income. Elevate Energy’s programs improve housing so families can live comfortably, reduce expenses, and help mitigate the struggles so many of Chicago’s residents face. We’ve helped thousands of families, but we have much more to do. And there’s much more our policymakers need to do so low-income families have a fighting chance to provide for themselves and reach the middle class. Stay tuned for updates from the Task Force.